Get Vendio Gallery - Now FREE! 2015 Topps Tier One Factory Sealed 12 Box HOBBY CASE-39 AUTOGRAPH+GU RELIC! 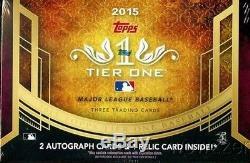 We are Proud to offer this Original 2015 Topps Tier One HOBBY FACTORY SEALED CASE!! This Factory Sealed HOBBY Case includes TWELVE(12) Factory Sealed Boxes!! Each Factory Sealed Box has 1 Pack per Box and 3 Cards Per Box. Each Factory Sealed Box Includes 2 AUTOGRAPH and 1 RELIC! Plus a Bonus Relic in every 4 Boxes.. So this 12 Box Factory Sealed HOBBY CASE includes a Total of THIRTY-NINE(39) AUTOGRAPH and Game Used RELIC Cards!! Look for Kris Bryant AUTOGRAPHS!! Look for Top Tier Autograph Cards, 1/1 Bat Knob and Cut Signature Cards!! See Complete Details of Product Below! Configuration: 12 boxes per case. Kris Bryant will have redemptions for an autographed card. Please note that info is subject to change. EVERY PACK GUARANTEES - 2 Autograph cards - 1 New Guard Autograph - 1 Tier One Autograph, Acclaimed Autograph, Clear One Autograph, Dual or Triple Autograph, Autograph Relic, or Cut Signature - 1 Relic Card - Every 4th pack will include a bonus Relic Card! - Every 12-count case guarantees 1 TIER ONE AUTOGRAPH card PRODUCT DESCRIPTION TIER ONE AUTOGRAPH SUBJECTS INCLUDE - Willie Mays - Roger Clemens - Cal Ripken Jr. Hank Aaron - Ken Griffey Jr. Nolan Ryan - Yu Darvish - Reggie Jackson - Clayton Kershaw - Frank Thomas - Mariano Rivera - Johnny Bench - Mike Schmidt - Miguel Cabrera - Mike Trout AUTOGRAPH CARDS Every single- and dual-subject autographed card is signed ON-CARD! Tier One Autographs More than 20 of the best players of all time will sign on-card. Sequentially numbered no higher than 99. Red Ink Autographs - Sequentially numbered to 25. Silver Ink Autographs - Sequentially numbered to 10. Gold Ink Autographs - Numbered 1/1. New Guard Autographs Nearly 100 rising stars will sign on-card. Sequentially numbered no higher than 399. Acclaimed Autographs More than 85 of the game's most popular current and retired stars will have on-card autographs. Sequentially numbered no higher than 299. Clear One Autographs 20 of the game's biggest stars will sign on card on a unique, multi-layered card. Dual Autographs 15 cards featuring classic pairings with on-card autographs of both subjects. Triple Autographs Five cards highlighting three stars with a common bond. Cut Signatures 25 cards featuring vintage autographs. AUTOGRAPHED RELIC CARDS Autographed Tier One Relics 25 active and retired stars featuring an autograph and patch piece. Dual Patch Parallel: A parallel with two patches per card. Triple Patch Parallel: A parallel where all three relics are patches. Dual Autographed Tier One Relics 25 pairings of two active and retired superstars, each with a game-used relic and an autograph. Autographed Prodigious Patches 25 active and retired superstars with a jumbo patch relic and an on-card autograph. Platinum Parallel - Sequentially numbered to 5. Cut Signature Relics Featuring 10 subjects with a cut signature and a relic piece. Tier One Autographed Bat Knobs 25 active and retired superstars with a bat knob embedded in the card with an on-card autograph. RELIC CARDS Tier One Relics Over 75 active and retired stars. Sequentially numbered no higher than 399. Dual Swatch Parallel A parallel with two swatches per card. Triple Swatch Parallel A parallel with three swatches per card. Tier One Legends Relics 20 retired stars. Sequentially numbered no higher than 99. Prodigious Patches 25 active and retired superstars with a jumbo patch relic. Tier One 1/1 Bat Knobs Over 100 unique cards featuring a game-used bat knob from superstars both active and retired. Tier One 1/1 All-Star Relics Up to 50 cards highlighting a unique, jumbo patch piece from the 2014 MLB All-Star Game workout jerseys. Limited Lumber Up to 100 active and retired superstars with unique bat pieces. Be Sure to check out our many other Items!! We stock a Huge Selection of Factory Sealed Boxes from every Sport! Plus the Largest Collection of Graded Cards in the World! Wait to pay until all items have been won OR 7 days after oldest item was won. (Please Note - we are not open on the Weekends and Holidays). We will NOT list a lower value or mark orders as gifts. We answer all emails within about 24 hours, Monday through Friday, and work to resolve all problems as quickly as possible. Unless an item is damaged, it generally needs to be in the condition it was received, either undamaged or factory sealed, to be eligible for a return. Note on Factory Sealed Boxes and Cases and Graded Cards. 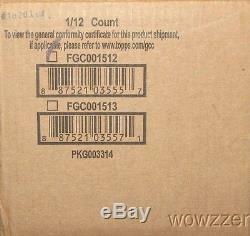 On listings for a factory sealed box or case, any cards shown are images of manufacturers samples and are not guaranteed to be in any particular box or case. On Listing for Beckett BGS Graded Cards. We answer all emails within about 24 hours Monday through Friday. We are an Internet only company; we do not have a retail location. Get your own map of past buyers. Spending hours revising items one-by-one? The item "2015 Topps Tier One Factory Sealed 12 Box HOBBY CASE-39 AUTOGRAPH+GU RELIC" is in sale since Saturday, January 02, 2016. This item is in the category "Sports Mem, Cards & Fan Shop\Cards\Baseball". The seller is "wowzzer" and is located in Santa Ana, California. This item can be shipped worldwide.